to whom it's disclosed, and how it's safeguarded. Unless indicated otherwise, this Privacy and Security Policy applies only to personal information collected through the Site. We would like to provide you with a safe and secure visiting and shopping experience. We value our Users privacy and respect your concerns as to the privacy of your personal information and data security. We reserve the right to amend this Privacy and Security Policy at any time in accordance with changes in this privacy and security practices. Unless stated otherwise, the current Privacy and Security Policy shall apply. Your continued access and use of our Site will constitute your acceptance of any changes or revisions to our Privacy and Security Policy. Personal and other information, information you directly provide through our Site when you establish or update your account, participate in a survey, quiz or poll, shop online, check the status of an order or review order history, join our mailing list or follow our brands on social networking sites, purchase and send a gift card, download or use our mobile apps, post customer reviews or apply for an credit card, etc. Categories of personal information collected may include, among other your name, e-mail address, postal address, and phone number etc., descriptive information like tastes and preferences, etc. 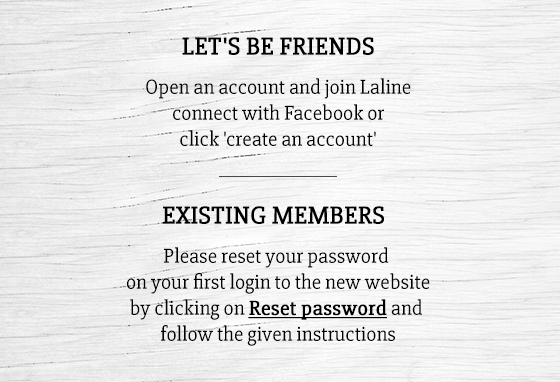 Information from other sources, including from social media and other websites that display authorized Laline's branding. For example, if you post a comment on any of our brands' Facebook pages or send us a message on Twitter, we may collect that information as described in this Privacy and Security Policy. We also may collect information about you from commercially available sources such as data aggregators, advertising member networks and public databases. Please note that we may combine or cross-reference this information with other information that we collect about you and use it as described here. Our Site use "cookies" that is actually a small computer file which is downloaded to your computer's hard drive when you visit a website. Cookies are harmless files which can help improve the experience. Cookies allow websites to respond to you as an individual. It's used to do things like see how you navigate this Site, what you click on, and remember you and your online purchases when you return. The website can tailor its operations to your needs, likes and dislikes by gathering and remembering information about your preferences. You can choose to accept or decline cookies. Most web browsers automatically accept cookies, but you can usually modify your browser setting to decline cookies if you prefer. This may prevent you from taking full advantage of the website. When you visit this Website, we collect navigational information, such as browser type and version, service-provider identification, IP address, the site from which you came, and the site to which you navigate. Navigational information is largely anonymous in the sense that it doesn't contain your name, address, phone number, email address or other information that directly identifies you. However, we may associate this navigational information with your personal information if you provide it. We use third-party services to help us handle parts of our business, such as third-party which provide certain features on this Site or analytics companies to better understand your use of this Site. These third parties use some or all of the technologies described above. The information collected by us shared on a limited basis with our parent company and affiliates, our employees and agents for the purpose of the service provided on the Site. The information collected by us was intended, inter alia to understand your needs and provide you with a better service, best visiting and shopping experience. We will not sell, distribute or lease your personal information to third parties unless we have your permission or are required by law to do so. However we release account and other personal information when we believe release is appropriate to comply with the law; enforce or apply our Site’s Terms and Conditions and/or other agreements; or protect the rights, property, or safety of the Site, our users, or others. This includes exchanging information with other companies and organizations for fraud protection and credit risk reduction. We may transfer your information to Laline's contractors which help Laline providing the services under this Site like fulfill orders, process payments, analysis your use, maintain databases, administer and monitor emails, administer and send mobile messages, serve ads on this Site etc. We will take steps to ensure that your personal information is treated lawfully in the manner we describe in this Privacy and Security Policy. In case Laline or substantially all of its assets are acquired by one or more third parties as a result of a merger, sale, consolidation or liquidation, customer information may be one of the transferred assets. Our Site may contain links to other websites of interest or display third-party content. We don't endorse or generally have any affiliation with these third parties. Once you have used these links to leave our site, you should note that we do not have any control over that other website. Therefore, we cannot be responsible for the protection and privacy of any information which you provide whilst visiting such sites and such sites are not governed by this privacy statement. You should exercise caution and look at the privacy statement applicable to the website in question.